Distance to an object can be measured with a single camera and a laser, if the laser position relative to the camera is known. Usually the laser is pointed in the same direction as the camera and mounted a known distance from the camera. 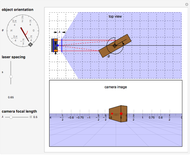 By dragging the locator, you can choose the orientation of the brown cuboid and two red lasers mounted units to the left and right of a camera, which has a focal length . 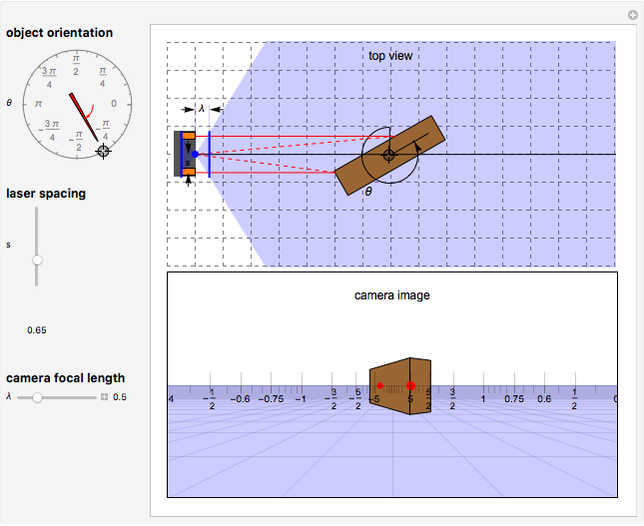 These lasers can measure the distance to the cuboid, as shown by the reticule on the camera image. The cuboid's angle can be computed from two distance measurements. All lines parallel to the camera frame's axis terminate at at the vanishing point in the image plane. Lasers mounted at and that terminate at coordinates and have image plane coordinates and . Thus the distance to objects with image plane coordinates and gives camera frame coordinates and . 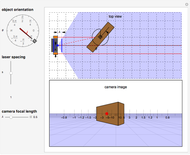 If both lasers strike the same object, the angle to the object is computed as . A camera's reticule (or graticule) is a net of fine lines in the scope. In this case, the reticule is aligned with the vanishing point of the lasers. The readings on the reticule directly measure the distance from the object to the camera. 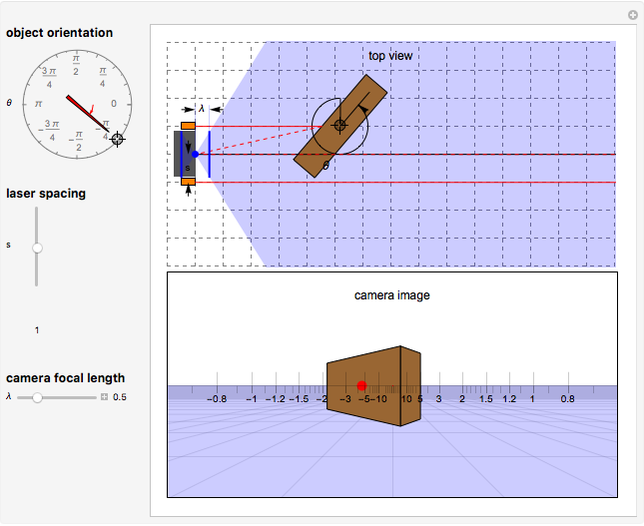 Shiva Shahrokhi and Aaron T. Becker "Measuring Distance and Orientation Using Camera and Lasers"